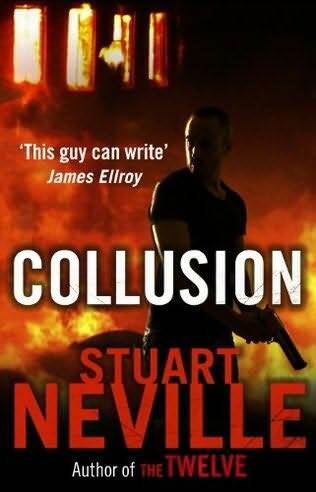 A good writer can find a story in what seems like there's not one: Stuart Neville's The Ghosts of Belfast (known in the U.K. as The Twelve) ended with little hint that there was more story to tell, but Collusion is indeed a fully realized sequel as powerful as the first novel. The threads that Neville pulls from the ruins of Gerry Fagen's life at the end of The Ghosts of Belfast include the eerie connection that he has established with young Ellen McKenna, as well as Gerry's promise to Marie, Ellen's mother, when he leaves her with a cell phone number for him. Also, readers of Ghosts will remember that Ellen's father, who abandoned Marie before his daughter's birth, was (as a policeman) the cause of Marie's estrangement not just from her family but from her entire community. The father, Jack Lennon (as a Catholic who enlisted in the police when it was still a bastion of Protestant Loyalism) suffered the same loss, and he's still an odd man out in the newly reorganized police of Northern Ireland. The other central character who remains from Ghosts is Bull O'Kane, one of a few survivors from Gerry's rampage. O'Kane, now in a nursing home he has eerily taken over entirely, has hired an assassin, known only The Traveller (implying a never-verified link to the outcast community of Travellers), and a good deal of the new novel follows his own rampage, echoing Gerry's in many ways. 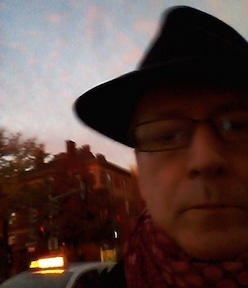 Gerry is now illegally in the U.S., though we know that, like Adrian McKinty's Michael Forsythe in The Bloomsday Dead, he will be pulled back home to protect someone who has no real claim on him. 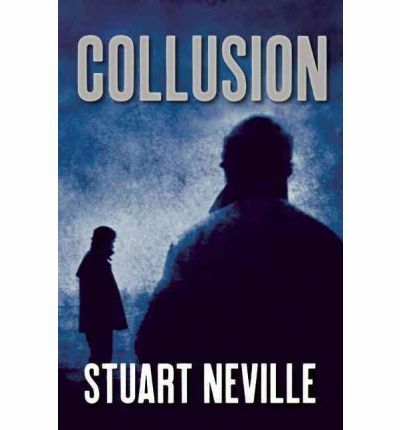 There's a dimension of Collusion that goes beyond Bloomsday Dead, related to the setting of Neville's novels in the North: the Collusion of his title refers to relations among British Army, the police, the Loyalists, the IRA, and so on, during the long violence so recently becalmed. Both Michael and Gerry were gangsters of a sort, but Gerry was political, and also, thanks to his ghosts, has nightmares if not exactly regrets about his career. Now that he has satisfied his ghosts, his nightmare now is psychological and perhaps psychic vision that hovers over the whole story like a premonition. When the violence (and this is a very violent story) begins to escalate, there's an element of two famous movies in the story: the first Terminator and the great Grand Illusion (if you know those movies you'll probably guess the grim comedy that Collusion shares with them--if not, let me know and I'll post the answer). And as the violence and also the pace escalates the novel becomes more and more compelling, the more so because as it moves along there are twists that take the story beyond the obvious directions. The first and more ambiguous of the two covers posted here is apparently the U.S. design, and the other, plainly showing a gunman and one of the novel's scenes, is the U.K. version. I think I like the hazy U.S. one better than the pulp-y U.K. one in this case, though both are evocative. 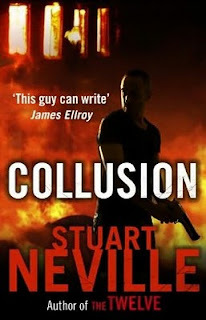 One of the sites on-line that advertises the release of Collusion suggests that one of the characters who survives the novel may be the center of yet another unlikely sequel: once again, perhaps, Neville will (fortunately for readers) find a great story in the ashes of the current one. I for one will be waiting impatiently: Collusion is a disturbing, unrelenting, and vivid trip into the nightmare aftermath of social, criminal, and personal death and destruction.